MELBOURNE, FL – Taylor Graphics, a cutting-edge trade printer and finisher, has invested in a JETvarnish 3D digital spot UV coater. Taylor Graphics, a California based printing company, has dedicated 100% of their efforts on trade printing. Owning the business for over 22 years, Dean Taylor’s knowledge and expertise has allowed Taylor Graphics to successfully grow to over 38 employees. Focusing on servicing print brokers, ad agencies and a variety of other printers, Taylor Graphics can provide high-end print finishing services from their diverse range of equipment. Always putting their customers’ needs first, Taylor Graphics began searching for a new piece of equipment to allow their customers to differentiate themselves from the competition. 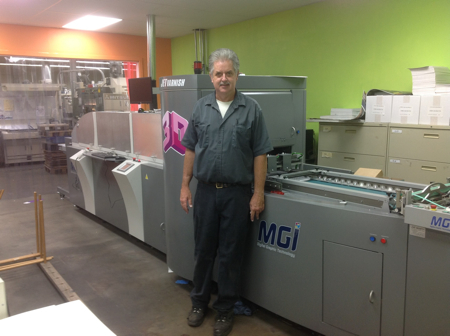 After looking at MGI equipment at tradeshows and connecting with Print & Finishing Solutions, a MGI certified Elite Dealer, Taylor Graphics decided to invest in a MGI JETvarnish 3D.